Glacier routes run the range from simple to complex. At one end are beginner glaciers that provide clear lanes of safe travel. 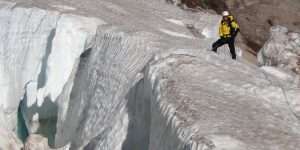 On the other extreme, we have glacier routes which require using snow bridges and belay techniques to secure our travel. We also offer educational courses in these skills.